List of World Heritage Sites in the U.S.A.
Hawaii Volcanoes National Park is a national park in the U.S. state and island of Hawaii. It is a UNESCO World Heritage Site. The park was created in 1916. In it are Mauna Loa, the Earth's biggest volcano, and Kilauea, the Earth's most active volcano. The park shows the results of millions of years of volcanism, and evolution. 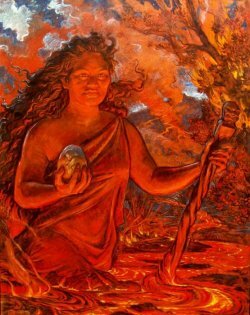 These processes thrust a bare land from the sea, and clothed it with complex and unique ecosystems, and a distinct Ancient Hawaiian culture. Kīlauea, one of the world's most active volcanoes, and Mauna Loa, the most massive, offer scientists insights on the birth of the Hawaiian Islands, and give visitors views of dramatic volcanic landscapes. In recognition of its outstanding natural values, Hawaiʻi Volcanoes National Park has been designated as an International Biosphere Reserve in 1980 and a World Heritage Site in 1987. On March 19, 2008, there was a small explosion in Halemaʻumaʻu crater, the first explosive event since 1924 and the first eruption in the Kīlauea caldera since September 1982. Debris from the explosion was scattered over an area of 74 acres (300,000 m2). A small amount of ash was also reported at a nearby community. The explosion covered part of Crater Rim Drive and damaged Halemaʻumaʻu overlook. The explosion did not release any lava, which suggests to scientists that it was driven by hydrothermal or gas sources. This explosion event followed the opening of a major sulfur dioxide gas vent, greatly increasing levels emitted from the Halemaʻumaʻu crater. Hawaii Volcanoes National Park Facts for Kids. Kiddle Encyclopedia.